I found many things to love about Until the Dawn. 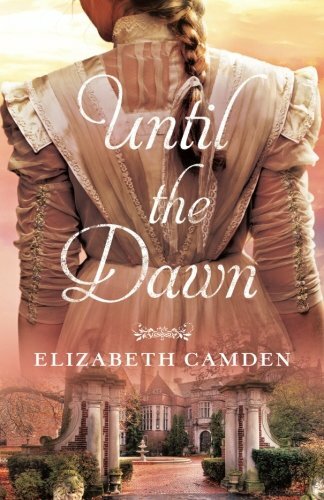 Elizabeth Camden has a pleasant writing style and an imagination which created an enjoyable story. Until the Dawn is filled with mystery, intrigue, the value of family, tolerance, sin, and salvation. A bit of romance too ;). Vanderbilt mansion is in Hyde Park, NY with the Vandermark mansion set upon “a windswept cliff in the Hudson River Valley”. Both the Vanderbilt’s and the Vandermark’s are of Dutch ancestry. Camden gives us fully created characters with very interesting lives. Our protagonists come from completely different backgrounds and have very different personalities. Those differences complement each other. They learn quite a bit from one another. Additionally, the myriad of bodyguards, townspeople, family, and scientists provide for quite an interesting cast. My favorite character? Ratface. Truly, who can’t fall for a man named Ratface? The Vandermark estate Dierenpark would be a place that I would love to visit. To spend a day with my husband talking and gazing at the scenery from the Spanish cannon, walking the lush grounds of the estate, going on a treasure hunt through the mansion, and finishing the day off in Sophie’s kitchen eating oysters from Marguerite’s Cove. It sounds blissful. Until the Dawn is a story that I found relaxing and enjoyable. I pray that you will find it so as well. Those of you who have been reading my blog for a while know that I am not a big fan of Christian romance books. So why on earth did I pick up another Christian romance book to read? For the love of my daughter. My beautiful daughter Amanda, like her twin, was seriously abused by her birth parents and I do mean seriously. That abuse caused brain damage. Amanda didn’t learn to read until she was about twelve years old. Reading is still not easy for her, at sixteen years old, so she has avoided books for the longest time. It was not until she was assigned to read Watershed Down by Richard Adams for an English class last year that I thought to purchase the book on the Kindle along with the accompanying Whispersync audio from Audible. This opened up a whole new world to her. She was able to follow the highlighted words on the page as it was read. She could stop and look up the definition of a word that she didn’t know. It brought the book to life for her. Amanda’s love for reading truly began though when she read her first Elizabeth Camden book. She had found a genre of books and an author that made her joyful. Books that took her imagination to fun, new, adventurous worlds. Her romantic heart was safely led along a romantic journey. This was pure joy for her. I had the opportunity to review Until the Dawn for Bethany House Bloggers and so I took it. This would provide another book for Amanda to read from her favorite author. Fortunately for me I found Until the Dawn to be a truly enjoyable read. I can see why Amanda likes her books. The stock in trade outline was rigidly adhered to but the details filling in the spaces are truly enjoyable. It proved an interesting ride to get to that formulaic end. Last thing… my daughter emailed Camden and was absolutely giddy when she emailed her back. She is very responsive to her fans. That was such a blessing. See my review of Serafina and the Black Cloak by Robert Beatty which also takes place at George Vanderbilt’s Biltmore Estate. She regularly posts about the joys of the book world at http://elizabethcamden.com/blog.